Storybook Villa # 2 - Vertrauen 100+ positive Kundenrezensionen, finden Sie in unseren anderen PROPERTY Storybook Villa # 1 durch Eingabe von 344.395 in die VRBO / Homeaway Suchleiste. IF werden Ihre Daten nicht für dieses Haus verfügbar, können Sie die Verfügbarkeit dort zu finden. Auch, wenn Sie eine größere Gruppe sind, ist es einfach, sowohl unsere Villen für Ihren Aufenthalt zu reservieren. Willkommen in Storybook Villa # 2, wo ein kurzer Spaziergang ist alles, was Sie von Disneyland trennt, und eine kurze Fahrt bringt Sie zu den vielen Sehenswürdigkeiten der Umgebung, die Southern California zu bieten hat. Finden Sie in der Karte, können Sie Ihre Familie Näher (10-14 Minuten zu Fuß zum Gate oder 5 Minuten zu Tram) nicht bekommen. Sie werden auf Parken speichern. Das Gesamtpaket beinhaltet: 5-Sterne-Bewertungen (vertrauen Sie unserer bewährten Marke "Storybook Villa" - siehe Bewertungen für Storybook Villa # 1 VRBO Eintrag # 344395. ), Günstige Preise, beste Lage, ein 2 Schlafzimmer, 2 kostenlose Parkplätze, Digitalkabel TV, Free Wifi, kostenlose Ferngespräche in die USA und Kanada, neue Frontlader Waschmaschine und Trockner, voll ausgestattete Küche - neue Edelstahl-Geräte. * View Fireworks auf der gegenüberliegenden Straßenseite. Zimmer gehören: King Bed & TV im Schlafzimmer (für 2). 2. Schlafzimmer mit Etagenbett (twin & full) & Trundle (4 Personen). Unten hat neue Schlafsofa (Full - für 2). Terrasse mit Sonnenschirm Tisch und Stühlen. * Essen für 8. 2 Pools & Kiddy Pool & Spa. Storybook Villa # 2: Entworfen mit Ihnen im Verstand: Es gibt nicht viel anderes zu, dass dies unser zweites charmant, großartiger Ort, hier draußen zu bleiben, in Süd-Kalifornien sagen, zentral gelegen, um so viel Spaß in jede Richtung und natürlich - Über die Straße von Disneyland! und California Adventure auch! Sehen Sie die Karte - Sie werden näher als nah. Wir kauften diese Immobilie mit LOCATION, Lage, Lage im Auge. Und wer profitiert davon? Sie. So stoppen Sie die Suche. Genau hier, genau jetzt, Storybook Villa # 2 ist mit Ihrer Familie eine einladende, warme, 2 Schlafzimmer, 1. 5 Badezimmer Stadtdomizil, renoviert und bereit für einen schönen Urlaub Experience hosten. Storybook Villa # 2 ist das Ferienhaus Sie schon lange suchen. Die Stadt Anaheim verlangt, dass alle Kurzzeitvermietung von der Stadt genehmigt werden. Die Genehmigung Nr für diese Auflistung ist REG2014-00066. Bitte beachten Sie, dass ab 1. Januar 2017 die maximale Belegung für diese Einheit 7 sein wird. Voll oben durch den Schlafzimmern. Half-Bad im Erdgeschoss für Bequemlichkeit. Von den Kinderwagen an den Crock Pot, um Waschseife, wir haben alle Extras hier für Sie ... ... Digital-Kabel-TV, Whirlpool, Kingsize-Bett, kostenfreies WLAN, kostenlose Ferngespräche in die USA und Kanada, renoviert, Waschmaschine und Trockner, voll ausgestattete Küche - neue Edelstahl-Geräte. Essen für 8 3 Pools, darunter ein Kinderbecken. Blick auf Feuerwerk vor den Toren. Schlafzimmer sind: König, Etagenbett (twin & Voll) & Trundle. Schlafsofa (Full). Terrasse. Tolle Preise, beste Lage, Hochstuhl, 2 Pack-n-Play-Krippen, 2 kostenlose Parkplätze, stressfreien schlüssellosen Zugang. * BESUCHEN SIE UNSERE WEBSITE StorybookVilla. com für weitere Informationen. This home was perfect! My wife and I brought our 6 and 8 year olds to Disneyland and this was the perfect place to stay. It is a quick 5 minute walk to the entrance to downtown Disney then another 5 or so to the park entrances. Very close! The condo was perfect for the four of us. My kids loved the bunk beds and the king was great for my wife and me. The kitchen is a little small, but well stocked. There was everything we needed. The living room was comfy and there is a huge selection of movies. Great detailed instructions on how to use everything as well. The laundry room was great to have and the detergent and dryer sheets were great to have available. There were also 3 strollers, 2 umbrella and one sit n stand, which would be great if our kids still needed them. There was a pack n play too, but we didnt use it. The bathroom was also a little small upstairs, but it was good for our family for the short time we were there. The available parking spot is extremely close to the condo and the garage would be great if needed. We didn't use it, but would be nice to have access to if we needed it. The pool was on the cold side, but my kids still loved it. We all enjoyed the hot tub! There were plenty of towels for all of us too. The fireworks were able to be seen from outside the condo, which was nice. Our kids go to bed early, so we were still able to see them. Not only is it close to the parks but also other restaurants like Bubba Gumps, House of Blues, In n Out, and so many others. These weren't nearly as crowded as the ones in Downtown Disney either. Quick and easy I-5 access as well. Overall, we really enjoyed our time here and would stay here again. PROS: The only way you could get closer to the park would be to stay in the Disneyland hotel itself, which is right across the street! I have parked at Disneyland and it took longer to walk through the parking lot than it did to walk to the park from this location. It's also perfect because you enter through the other end of Downtown Disney than the parking lot so there is no line to get your bag searched, at least there wasn't for us (we went first week of March). The kids were super excited that there was a Mickey themed bathroom and a large Mickey in the house as well as candy and coloring books to greet them! There are lots of kids DVDs to keep the kiddos distracted while you pack up for the day. There is a gate at the top of the stairs for safety when we had the kiddos up there which was nice. We didn't need them but there were 2 strollers and 3 umbrella strollers in the laundry room. There was laundry soap and dish soap available. They had a pack n play already set up for us in the closet of the master bedroom which worked out really well cuz we could close the door there and be able to move around the room without our baby hearing or being awoken from light. CONS: We but we did a lot of meal prepping while we were there so we didn't have to buy food while in the park and I would suggest bringing your own knives if you plan on cooking. The ones there are not sharp. Also the beds are squeaky. We will definitely stay there again if we can! I'm shocked that this home has such good reviews. The floor is broken in the master, the pack 'n play had gum stuck on it, the bed in the kids room is the most uncomfortable bed we have ever slept on and the master bed squeaks every time you moved. The furniture is very worn and old. That being said, the location was fantastic, just a quick walk to Downtown Disney and the stroller provided was very helpful. We did use the pool area. The pools were extremely dirty but we did like having access to a hot tub. Mindy & Josh did allow us an early check-in, which was nice. All in all, I would definitely stay at this complex again, just a different home. We booked this trip a few months in advance and then had a potential family emergency, the owners were willing to work with us at a loss to themselves. They also responded quickly when there was an issue with a toilet. We loved all that this home had to offer; plenty of space, all the essentials included, the washer/dryer and strollers/pack n play were AMAZING! Not to mention the location is perfect! I highly recommend this property and will try to stay here again next time we go to Disney- thank you for everything. Great location for family Disneyland fun! This property was a perfect location for walks to Disneyland and came with all the amenities to make for entertained, happy children! Upon arrival Josh and Mindie had left greeting gifts for our children, which thrilled them! There was ample selection of games, toys and children's movies, along with strollers (many to choose from! ), a high chair and bunk beds that my children loved. There are some updates that could be made to the home (the flooring was damaged in the main bedroom, may want to consider replacing the shower curtain, etc. ), but overall the property was clean and comfortable. We appreciated the owners' responsiveness when we weren't able to access the garage, and enjoyed our stay very much. 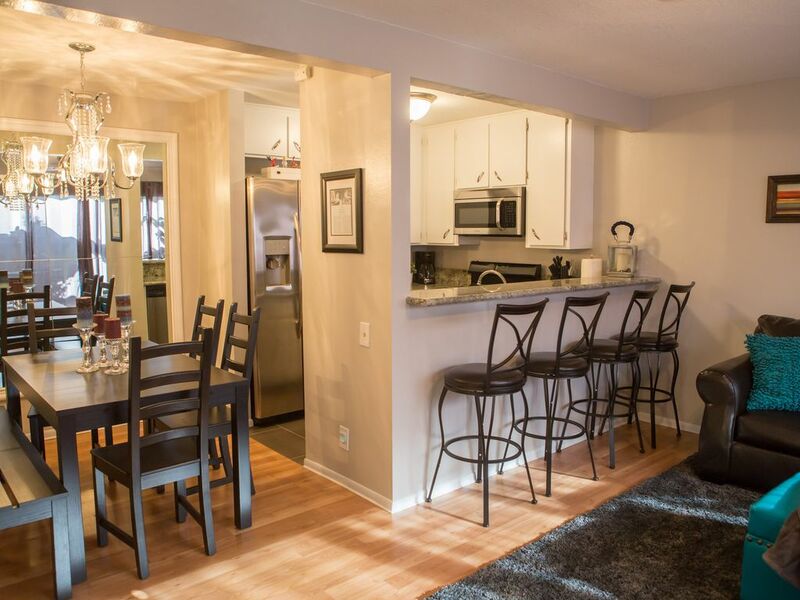 Great spot for our family of 4, so close to the parks! Great condo. Well appointed. Nice and close to the parks. It had everything we needed for our girls and an easy (and fun!) week at Disney. Anaheim, CA ist die Heimat von Disneyland und zentral gelegen. Los Angeles und allen seinen Attraktionen (Universal Studios, Hollywood, Zoo, Santa Monica Beach & Pier) ist unmittelbar nördlich, ca. 30-45 Minuten mit dem Auto. Autobahnen sind leicht zugänglich (direkt um die Ecke). San Diego ist ab sofort in den Süden. Sea World, Legoland, der Zoo und Wildpark erwarten Sie dort! 1. 5-2 Stunden entfernt. Wenn Sie näher an "Heimat" während hier bleiben wollen, haben Sie Glück. Orange County verfügt über Strände (Huntington, Newport, Laguna, Balboa Island), Freizeitparks (Disneyland, California Adventure, Knott Berry Farm), Wasserparks (Soak City, La Mirada Splash), Family Entertainment (Downtown Disney, örtlichen Märkten, Medieval Zeiten Dinner & Tournament), & family fun (Irvine Park & ​​Zoo, Discovery Museum und mehr!). *Reserved parking *American Express accepted - contact us *Family-owned & operated. Permitted with the city of Anaheim. *Tax Update: Per city code, ALL rentals/guests are subject to 15% transient occupancy tax for stays July 1, 2015 & after. Avoid future unexpected headache & fees - reserve with those that disclose this tax.